Microsoft has never released Publisher for Mac but you there are ways to run it on macOS. Although there are some great alternatives to Publisher on Mac, many people that have recently switched from Windows still require MS Publisher for desktop publishing. Installing Windows is also the only way to open the Microsoft PUB Publisher file format on a Mac although you can convert Publisher files into another format and import them into other DTP apps. Just follow these instructions to install Microsoft Publisher on your Mac. Download and install Parallels on your Mac. Parallels (check out our full review here) is an incredibly useful tool that allows you to run Windows at the same as macOS. Once installed, you can install any Windows application or game on your Mac, including Microsoft Publisher. Note that we recommend having at least 30GB of space free on your Mac in order to install Windows on your Mac using Parallels. When you download Parallels, double click on the Parallels installer which will will take you through the setup wizard. Since Parallels version 12 and above, it now gives you the option to download and install Windows 10 directly from Microsoft without leaving the Parallels setup wizard. The cool thing is you can now install Windows 10 for free on Mac – Microsoft no longer require users to activate the full version unless you want to customize the look of it or remove a small watermark. You’ll either see one of two screens when you start the Windows setup, either this one which will take you through the Windows setup automatically. 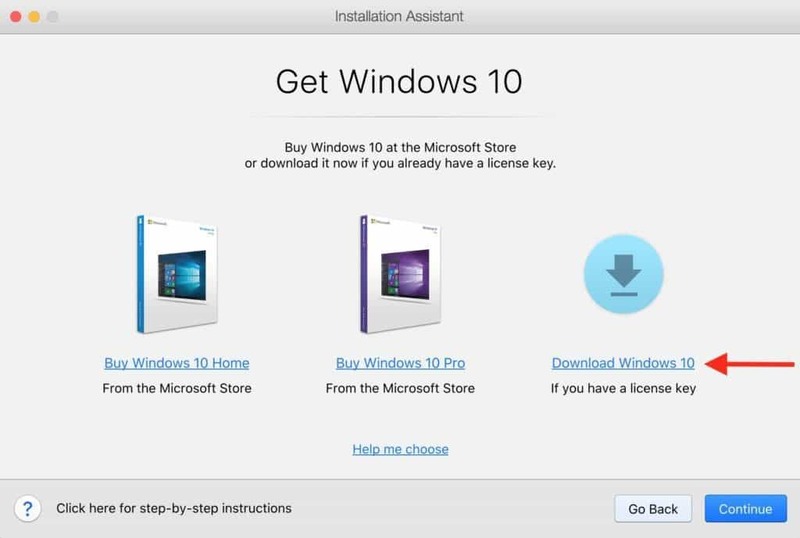 You can click Install Windows and skip straight to Step 6 in this tutorial. Or if you’ve previously install Parallels before in the past, you may see the setup wizard below. If you see the latter, simply click on Get Windows 10 From Microsoft to install it without leaving the Parallels setup wizard. You’ll see the following screen – click on Get Windows 10 even if you don’t have a license key as it’s not essential to activate Windows anymore in order to use it. Parallels will then start to download Windows 10 automatically. Alternatively, you can manually download Windows 10 for free from Microsoft and then save it onto a pen drive or external drive for Mac with at least 5GB of storage space on and select Install Windows or another OS from a DVD or image file. Whichever way you choose to buy Windows 10, make sure you get the 64 bit version and not the older 32 bit one. If you decide you want to buy it so that you can customize the look of Windows and remove a watermark, you can buy Windows 10 direct from Microsoft or you can sometimes can it slightly cheaper from Amazon. Note that if you own an earlier version of Windows such as Windows 7 or Windows 8, you can also download an ISO image of it first and then put it on a storage device such as an external hard drive, pen drive or burn it onto a CD or DVD if you have a CD or DVD drive. Before Windows installs, you will be prompted to sign-up for a free Parallels account. Just enter your email and create a password or sign-up with your Google/Facebook account. This version requires a product key (unless you have purchased a Windows 10 Product Key but as mentioned earlier, you don’t need a product key to use Windows 10). Click the checkbox for Express Installation. Choose what you’ll mainly be using Parallels for. For the purposes of Microsoft Publisher, the best option is Productivity. Select a location on your Mac hard drive to install Parallels and give it a name e.g. “Windows 10”. Note that you’ll need at least 20GB of hard drive space free to install Parallels which is enough space for Parallels, Windows and Publisher to operate smoothly on your Mac. However we recommend having much more space so that you can install more Windows programs and games at a later space but you can change this later if you have to. The Windows setup wizard will then start just as if you were installing Windows on a PC for the first time. Simply select the language settings that are appropriate for you. If you got the Windows 10 auto installer at the beginning of step 2, you may not see these setup screens as it will automatically detect your language and region settings. When prompted whether to perform an Upgrade or Custom install select Custom. Windows will then take some time to setup and install on your Mac. You’ve now installed Windows on your Mac are are ready to install Microsoft Publisher. Nowadays, Microsoft Publisher 2016 is part of Office 365 and you’ll need an Office 365 subscription in order to continue. If you already have one, open Internet Explorer in Windows and go to the Office 365 login or you can open the login from within the Windows Start Menu. If you haven’t got an Office 365 you’ll need to get an Office 365 subscription first which start at $7.99 per month which can be cancelled at any time. You may also be able to get a slightly cheaper deal for Office 365 if you buy it from Amazon too. You can also try a free trial of Office 365 on Windows although you’ll need a credit card to do so. Once you’ve setup or logged into your Office 365 account, simply select Install Office from the Office 365 home page. If prompted, make sure you install the 64 bit version of MS Office and not the 32 bit version for older versions of Windows. If you’re prompted with the warning “Do you want to allow this app to make changes to your device?” click Yes. The Microsoft Office installation will then begin. When the installation is done, you’ll receive a confirmation message with an animation showing you that you can see where your Office applications are installed by going to Start > All Apps in Windows. You’ll see Word, Excel, PowerPoint, Outlook, OneNote, Publisher and Access. Go to Start > All Apps in Windows and select Publisher. When you open an Office application for the first time, you’ll be prompted to accept that it will be updated automatically by Microsoft. Just click Accept to launch Publisher. You’re done! You can now use Microsoft Publisher on your Mac just as if you were using a PC. The great thing about Parallels is that you can switch back to macOS at any time without rebooting or shutting down. You thus get the best of both worlds – MS Publisher running on your Mac while being able to access all if your Mac applications and documents whenever you want. If you have any problems installing Microsoft Publisher on your Mac, let us know in the comments below.